I'll never scratch the surface of great places in Connecticut, a state very well covered by Roadfood.com. HERE'S A LINK TO ALL OF THE ROADFOOD OFFERINGS. Some overlap, although I do a have a few of my own. Not so many years ago this was a roadside hot dog cart. They grew into a viable restaurant. 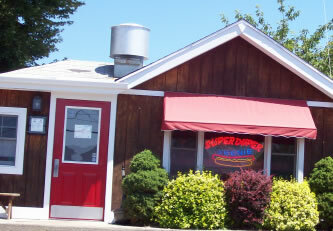 They do up a dog as good as anyplace I know of ... A super variety from Chicago to New York style. This is a place that grew from nothing over the last 25 years or so. 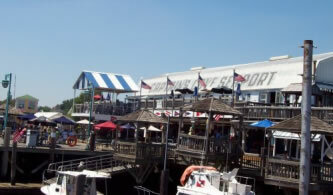 Tremendous on-the-dock seafood downstairs and a nice open airy bar upstairs ... all overlooking a marina. A nice, clean, basic Hungarian meat market. 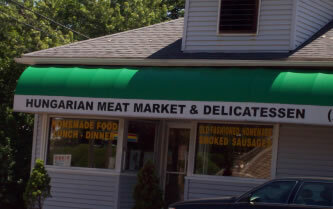 A great place to stop and pick up some goulash to go. Plenty of other meal fixin's too. I can't seem to find their address on the web. They are on Route 1, east of the circle. 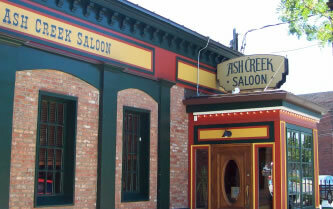 Here's a boisterous place with a lively bar. I've never ordered anything but the ribs there ... they smoke them someplace else, but somehow they turn out excellent. Note the two Guinnesses to denote a very good pour. Best Western Black Rock ... Beware: The Fairfield Inn in Fairfield is not affiliated with the Marriott chain. Be careful, although Bridgeport now boasts an occasional nice spot like Captain's Cove, downtown and other sections can be scary places. Lots of homemade goodness. 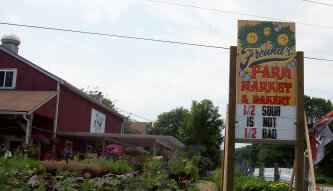 Fresh farm stand goods and a nice garden center in north eastern, Connecticut. Delightful and filling grinders with plenty of quality ingredients. Excellent wood fired pizza. Tremendous shells and sauce. 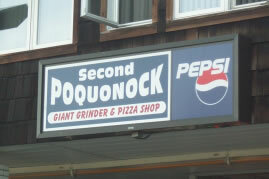 The original which is the first in Hartford and the last in Wethersfield has been around for years. They are becoming a chain ... so I am ready to be disappointed sooner or later. ww.firstandlasttavern.com ... Check the site for other locations. Tremendous, foot long char broiled hot dog. Good fries and onion rings. Also a tremendous hot lobster roll. These folks have made a living for generations cooking spinach into Italian bread ... for a good reason ... it is excellent. They do pepperoni and broccoli bread too! Stock up, they travel and freeze very well! Plan to eat at least one in the car. 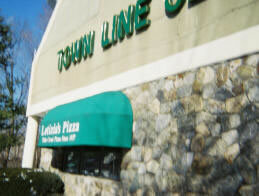 Eli's Brick Oven Pizza ... When they took over for a beloved institution, Bimontes, I expected the worst. Happily they put in a brick oven, brought some family knowledge from Wooster Street and even kept my old favorite, The Bimonte Special, and somehow it even tastes better than I remember. The only thing to order here is the SG cheeseburger with four slices of cheese that spills over onto the grill to crisp up to a heavenly treat. There are two of them ... within blocks. 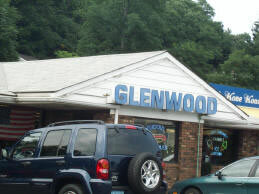 One of two stellar steamed cheeseburger places in central, Connecticut. 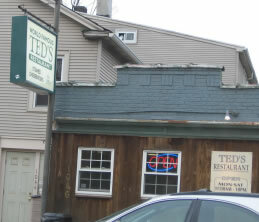 One of the very few steamed cheeseburger places special to central Connecticut. When this place burned down, the community chipped in to rebuild it. This is the center of the universe for fans of good, rustic pizza. 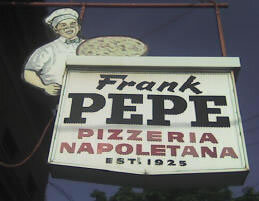 Many people who have not had a good authentic pizza will take a look at a Pepe's pie and wonder if it is burned. The truth is this is the perfect pizza. I feel bad for people who have had so much Pizza Hut, or Little Ceaser's that they can't appreciate perfection. Try a white clam pizza too. Both have loyal fans. I like them both, leaning just a little towards Pepe's. Don't have dessert with your meal on Wooster Street. 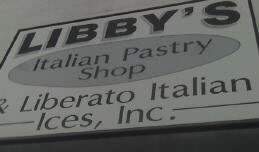 Head to Libby's for gelato and good Italian pastries. Superb white tablecloth Italian dining. This, they say, is the origin of the hamburger as we know it. Nice fresh ground beef, cooked in a sideways cooking contraption served on Pepperidge Farm toast. Available with onion, cheese and tomato. Nothing else ... i.e. no catchup ... don't even ask. Excellent wood fired pizza in a club setting. Nice place for a relaxing drink and some good pie. Modern Apizza ... Very popular. Very good. It is just when I am in the area, I opt for Pepe's, Sally's or Eli's in Hamden. No reason to avoid Modern. 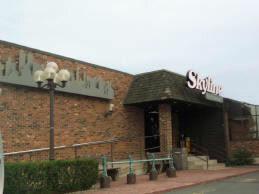 Here is a treasure just on the outskirts of pizza-rich southern Connecticut. I've only had the Garbage Pizza and it was one of the best I've ever had ... I recall it is pretty much take out only ... AND VERY WELL WORTH THE TRIP! Just up the road past the DMV. 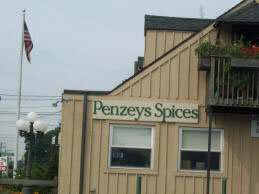 This is one of the earlier outposts for Penzy's catalog operation. Stores are popping up all over the place ... but as this was my first, it remains in the listing. Just about the closest restaurant to the airport. 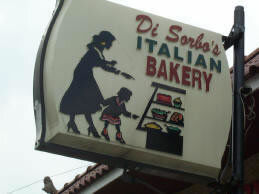 Excellent Italian food, plus a pretty comprehensive menu that should find something for everyone. A nice lively, friendly bar. Be sure to get the salad bar buffet with lunch ... that's the only way you get to sample their more than viable pizza. On Thursday and Fridays the do a food layout for Happy Hour that could easily make a meal. Go past the pasta, fried chicken and pizza dishes and order up an, aptly named Giant Grinder. Get it to go. You'll never finish it. I get four meals out of one. I usually get an Italian cold cut grinder with peppers. Half the magic here is the perfect bread the use. Gold's Deli ... for almost NYC quality bagels and almost NYC quality meats. Make your own analogy about the service. Fortuna's Deli ... is more of an American deli combination cafeteria. You can put together a decent meal. S&S Dugout ... for a good "flattop"breakfast ... their fried mashed potatoes are a nice change of pace from home fires or hash browns. There are far too many "exclusive" places popping up -- and not surprisingly dying out all the time. Head up to Fairfield/Bridgeport for some far better eating options. It has gotten so there is no place to stay in Westport ... The Westport Inn has doubled in price over the last few years with no noticeable increase in quality. I stay in Fairfield now adays ... There are even more good places to eat out that way these days. UNRELATED: Mitchell's is one of the best men's clothing stores you will find anyplace.